My blogging recently has taken a back seat to the influx of family staying with us – some might consider this a natural disaster, but we have enjoyed the additional textures in our lives. 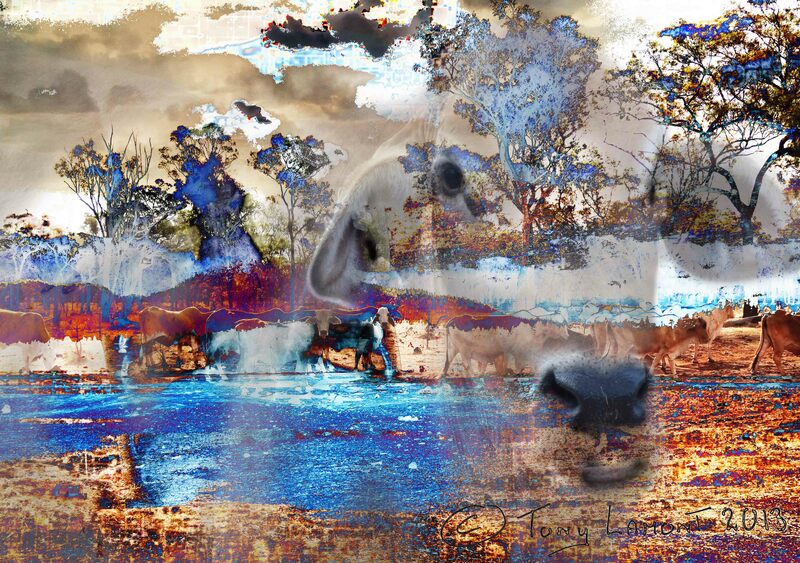 This picture shows beef cattle from an area affected by drought in North Queensland where they scrape a living in the hot dry conditions. The photographs were taken on a scorching afternoon where the mirages sat just above the road and the dust devils wandered around chasing twigs and dry leaves. The dusty ground through which the cattle are walking has taken on a blue tinge through the blending process, against the gold, which looks just like those mirages. Both cattle and humans are hosts for RSV the Respiratory Syncytial Virus, and infected under the same conditions. Cattle have been shown to be at higher risk at times of stress such as drought. This provides the link to the included chest X-ray which was taken from an 18 month old child with bronchiolitis due to RSV. It causes inflammation of the smallest air passages of the lungs known as bronchioles and occurs in children less than two years of age. Important preventative measures (in humans) to prevent spread of this condition include simple things such as regular hand-washing. One way to improve a child’s immunity is to feed breast milk especially in the first month of life. Although it is not 100% protective breast feeding is more effective than either stopping maternal smoking or passive immunisation with injections, though both help. Unfortunately cows milk and formula do not provide protection. Inland Queensland is in the grip of a prolonged drought. The normally fertile grazing country is dry as a bone and cattle graziers are struggling to keep their herds fed. Some are having to shoot cattle to reduce numbers. Those that are left are thin and weak. When the rains do start they will bring some relief but their own problems too, due to the sudden change of diet, and onset of disease in immune-compromised cattle. 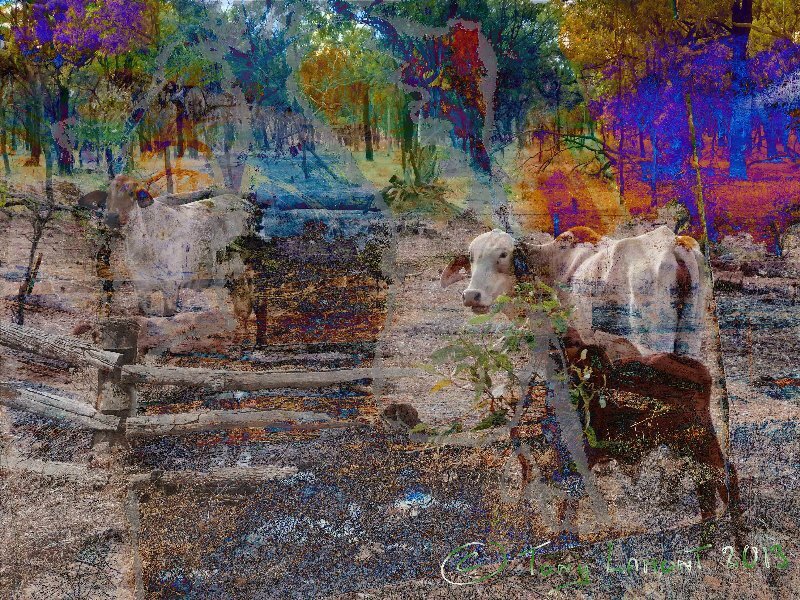 I have tried to link a hot dry outback image with the lean cattle and the X-ray. The situation links with the child’s X-ray from Africa with kwashiorkor . This is a condition I became familiar with during my time in Zambia and Zimbabwe. The name kwashiorkor means “the sickness the baby gets when the new baby comes”. It is a form of protein-energy malnutrition due partly to poverty, premature weaning from breast feeding, and too early introduction of solids that have carbohydrates but insufficient protein. Once a baby develops this disease the liver is damaged and repair is slow. Nutrition cannot be introduced quickly or the breakdown of protein overwhelms the liver and can be fatal.